Pinos Altos is located in the mountainous region of northern Mexico, 220 km west of Chihuahua. It is an open-pit and underground mining operation containing substantial reserves of gold and silver. The nearby Creston Mascota deposit is a stand-alone pit and heap leach operation that is a satellite of Pinos Altos operations. Pinos Altos has proven and probable reserves containing 1.2 million ounces of gold and 30.5 million ounces of silver (17 million tonnes grading 2.15 g/t gold and 55.50 g/t silver) as of December 31, 2018. The Pinos Altos mine is expected to produce 165,000 ounces of gold in 2019, and 150,000 ounces in 2020. The mine transitioned into a predominantly underground mining operation in 2018, with associated higher costs. Separately, Creston Mascota has proven and probable reserves containing 82,000 ounces of gold and 1.9 million ounces of silver (1.4 million tonnes grading 1.77 g/t gold and 40.89 g/t silver) as of December 31, 2018 (including the Bravo deposit located immediately to the south). In 2018, the Creston Mascota pit transitioned to the Bravo pit, with higher costs due to longer hauling distances and higher stripping volumes. 2019 is expected to be the last year of mining activities at Creston Mascota, with leaching activities expected to continue through 2020. Costs are expected to decline once mining activities have ceased. Creston Mascota is expected to pour 35,000 ounces of gold in 2019 and 22,500 ounces of gold in 2020 when it is expected to complete operations. Pinos Altos lies in the Sierra Madre gold belt, on the northeast margin of the Ocampo Caldera, which hosts many epithermal gold-silver occurrences. The property is underlain by volcanic and intrusive rocks disturbed by faulting. Its geological focus is a horst structure – which is an uplifted block of rocks – at least 10 km long by 3 km wide, defined by the Reyna de Plata Fault to the north and the Santo Niño Fault to the south. Pinos Altos mine’s mineral reserves are in four zones hosted by the Santo Niño Fault – the El Apache, Oberon de Weber, Santo Niño and Cerro Colorado lenses – as well as the San Eligio lens 600 m north of the fault, and the Sinter and Reyna de Plata zones in the Reyna de Plata Fault. More than 35% of the current Pinos Altos mineral reserve is located in the steeply dipping Santo Niño vein zone, which is up to 40 m thick and 2.5 km long, and another 31% of the reserve is in the adjacent Cerro Colorado zone. Sinter currently has 10% of the gold in the Pinos Altos mineral reserve. The Reyna de Plata deposit, 1,740 m to the southeast of Sinter, consists of low-sulphidation epithermal vein-style mineralization over a 2.5-km strike length in an east-west direction from surface to locally as deep as 250 m. Reyna de Plata reported initial mineral reserves of as of year-end 2018, comprising 6% of the gold in the Pinos Altos mineral reserve. The property separately has mineral reserves in the Creston Mascota deposit approximately 7 km northwest of the other lenses, and the Bravo Zone adjacent to Creston Mascota. Other promising zones include the Madrono Zone (southeast of Creston Mascota), and the Cubiro deposit, which is 2 km west of Creston Mascota. Pinos Altos has been a series of open pits and an underground mine along the Santo Niño Fault. Surface mining has been carried out at the Santo Niño and Oberon de Weber pits (both of which are now depleted). The San Eligio pit is in production and the El Apache pit will be mined next. Mining is by conventional open pit methods, using shovels and trucks. The underground mining method is sublevel stoping (paste backfill) to extract ore from the Santo Niño, Cerro Colorado and Oberon de Weber deposits. The shaft project for hoisting underground ore was completed in mid-June 2016, increasing the planned capacity of the underground mine to 4,500 tonnes/day. Underground mining of the Santo Niño crown pillar began in late 2017, using long-hole sublevel stoping from surface to extract ore. The crown pillar ore is transported from level 16 to the surface by trucks via a ramp system. The Sinter deposit, located approximately 2 km northwest of the Pinos Altos mine, will be mined from underground and a small open pit. Underground development is underway. The Cubiro deposit, located approximately 9.2 km northwest of the Pinos Altos mine, could potentially supply high-grade ore to the Pinos Altos processing facilities. Underground development has begun at Cubiro, and underground exploration and mineral resource conversion drilling are expected to commence in 2019. Creston Mascota is an open-pit, heap-leach facility. It employs the same surface mining method as Pinos Altos. Mining transitioned from the Creston Mascota deposit to the Bravo deposit (to the immediate south) during 2018; Bravo also utilizes the Creston Mascota heap leach facilities. Ore from the Pinos Altos mine is treated by two different processes – conventional processing in a mill, as well as the lower grade ore through heap-leaching. The conventional, 5,500-tonne/day process plant includes crushing, grinding, gravity concentration and agitated leaching followed by counter-current decantation. During 2017, the Company commissioned a silver flotation plant, which has increased overall silver recovery to an average of 22% in the flotation plant. Gold and silver are recovered using the Merrill-Crowe method, and a refinery produces gold/silver doré bars on site. Metals recovery in the plant is expected to average 95% for gold and 54% for silver over the remaining life of the mine. An ore sorting pilot plant was installed at Pinos Altos in 2018 to determine if it can improve feed grades to the processing facilities. Testing is expected to continue for half a year, during which samples will be processed from all of the ore bodies at Pinos Altos and La India to determine the merits of implementing the technology at the Company's Mexican operations. The lower grade Pinos Altos ore is treated in a heap-leach system designed to accommodate 5 million tonnes of material over the life of the mine. The heap leach facility is expected to contribute about 1% of the total metal production over the remaining life of Pinos Altos mine. 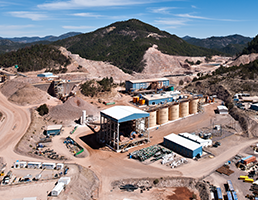 The Company anticipates precious metals recovery in the Pinos Altos heap leach facility will average 74% for gold and 16% for silver. All the Creston Mascota ore is processed using heap-leaching. Its 4,000-tonne-per-day heap leach facility is similar to the Pinos Altos facility, but includes three stages of crushing and agglomeration, and the precious metals are recovered by a small carbon adsorption circuit. In 2018, work on the Phase V leach pad expansion was completed and stacking of material began at the end of 2018. Heap leach recoveries for ore from the Creston Mascota deposit are expected to average 67% for gold and 30% for silver. Several satellite mining opportunities exist around Pinos Altos that are being evaluated for their incremental production potential. The Cubiro deposit is an underground exploration opportunity 2 km west of Creston Mascota. It is envisioned to potentially produce high-grade ore that could be trucked to the Pinos Altos processing facilities. An access road was completed in September 2018, when ramp development began; 460 metres of underground development is planned. Underground exploration and delineation drilling are expected to commence in 2019. The Reyna de Plata deposit is an opportunity for another satellite source of ore on the Pinos Altos property, approximately 1,740 m southeast of the Sinter Zone. The Reyna de Plata deposit hosts initial mineral reserves of 72,000 ounces gold (2.3 million tonnes grading 0.96 g/t gold and 29.3 g/t silver). These mineral reserves form part of the total Pinos Altos mineral reserve estimate as of December 31, 2018. There is growth potential down-dip from the Reyna de Plata deposit and along an additional 1.5 km of structure immediately to the east of the deposit. Different mining options are currently being studied to advance the deposit into the Pinos Altos production schedule. The current exploration program is part of the activities to increase the mineral resources at Reyna de Plata. In 2019, the Company expects to spend $3.1 million on exploration at the Pinos Altos mine and the Creston Mascota deposit, including $1.4 million on 5,000 metres of step-out and exploration drilling at the Cubiro deposit, and $1.5 million on 6,000 metres of exploration drilling at the Reyna de Plata east extension and the Moctezuma trend. The Madrono zone is a potential satellite mining opportunity to provide mill feed to extend the mine life at Pinos Altos. The Madrono prospect is just 0.5 km from the Creston Mascota pit and the Bravo Zone. Previous mining in this area included small-scale bonanza production from underground mine development on three levels in the 1930s. Mapping and sampling of historical mine workings quickly identified high-potential targets. The indicated mineral resources at the Madrono zone are 169,000 ounces gold and 3.0 million ounces silver (2.7 million tonnes grading 1.93 g/t gold and 34.13 g/t silver), all at underground depth. The Madrono zone also has inferred mineral resources of 43,000 ounces gold and 331,000 ounces silver (532,000 tonnes grading 2.51 g/t gold and 19.33 g/t silver), all at underground depth. The Madrono zone’s mineral resources form part of the total Pinos Altos mineral resources estimate as of December 31, 2018. Madrono includes at least five gold-silver veins: Molino, Madrono, Santa Martha, Madera and El Salto. Recent results at Madrono are encouraging for the potential of open pit deposits in the Madrono, Santa Martha and Madera veins, as well as significant high gold grades supporting a potential underground mining scenario. Drill results are encouraging for the potential of a broad area of mineralization at the junction of the Madrono and Santa Martha veins. These intercepts indicate the presence of an ore shoot plunging to the southwest with potential to grow at depth and laterally. The Madrono zone including the El Salto vein continues to be open at depth. Pinos Altos poured its first gold in July 2009 and achieved commercial production in November of that year, while underground mining began in the late spring of 2010. Shaft-sinking began at Pinos Altos in 2012 to increase the underground design capacity. Completion and commissioning of the shaft project was achieved in July 2016. The nearby Creston Mascota satellite operation was built in 2010 as a stand-alone pit and heap leach operation. It poured its first gold in December 2010, and achieved commercial production on March 1, 2011.